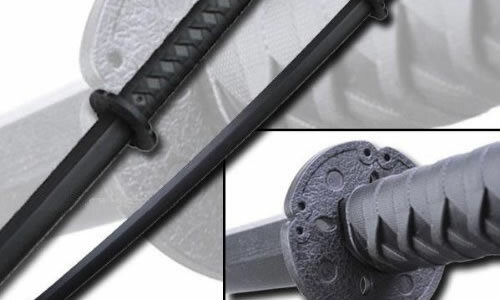 For practice or even just for display purposes, a wooden katana is a cheap choice. They are imitations of the real samurai sword, and are usually classified as bokken. Most bokken are however completely made of wood and many don’t have a hand guard, but regular wooden swords can also feature leather handles with tsuba or other differences. Note: if you’re looking for wooden katana for practicing Kendo see Shinai and Bokken. Below I’ve selected a few wood katana which are suitable for practice or training, and some could even be used as a decorative sword when mounted on a stand.